The following article was originally featured on Life and Love. Multipled., a personal blog by Twiniversity contributor Maigen Beaulieu. 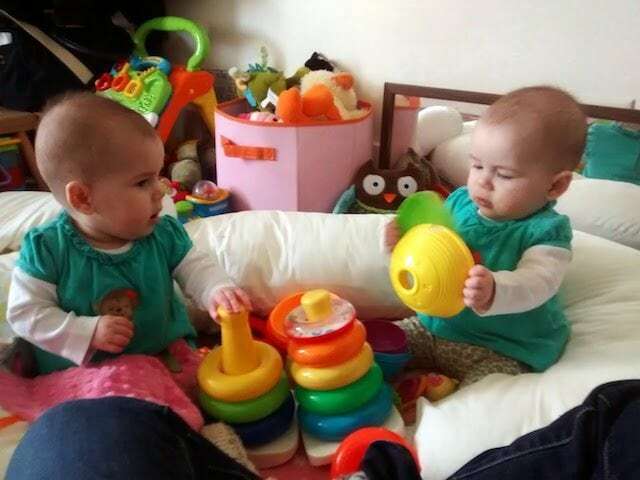 One of the biggest concerns I had when we found out about the twins was how I was ever going to get stuff done around the house with two babies? Or shower on no nap days? Or even just use the bathroom any day?? Children grow, learn, and develop best with lots and lots of free play time on the floor. We know now that overuse of propping or other baby receptacles has potential to inhibit their natural development. While some days mom loves to just hold or play with her babies for hours on end, eventually there is laundry to be done or dinner to be cooked, and those things rarely coincide with nap time. 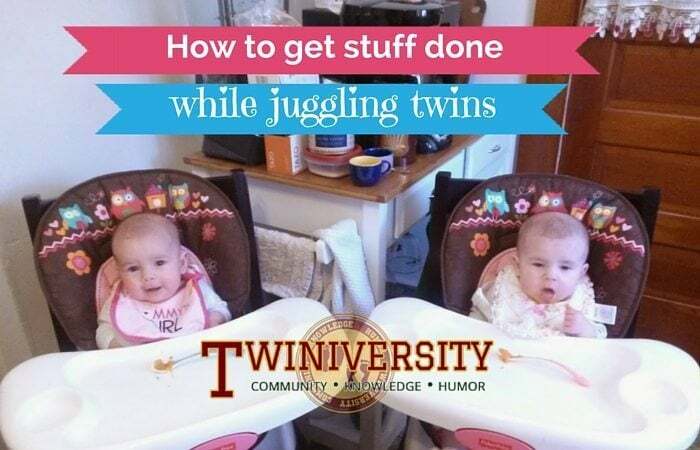 When you have twins or more than one child there are days that everyone’s out of sync and there is no “nap time” to get things done, as one will be up while the other sleeps. Those days are LONG. Knowing this struggle, here’s my list of my favorite resources for any budget that can help you figure out how to get stuff done (in and out of the house) while still being a present parent to your twins! Perfect for newborns to sleep or lay in and also appropriate for some contained playtime, bouncy chairs are a must. The vibrate feature can knock out even the fussiest baby and the elevation means they can see you without having to strain to do so. You can bring them in the bathroom while you shower, in the bedroom while you fold and put away clothes, or just leave them in the living room within eyesight to get the dishes done. The only con we found is that they take up a bit of space. We stopped using ours around 4 months too so I would highly suggest buying used considering the little time these are used. A fellow twin mom friend let me know about this and I will be forever grateful for it. Take a rectangular laundry basket and line it with blankets. Place a baby at each end and put toys in their laps and throughout the basket and you have an easily transportable playpen. It goes in the kitchen with me while I cook, on the back porch for some safe outside time, in the bathroom so I can shower and in the living room when they’re not feeling the playmat or anything else. Too cold outside? Pop them in front of a window for a change of scenery. They can see everything and they love it! This is the most budget friendly option as what family doesn’t have a laundry basket? While we’re on the subject of ways to support two babies, my Snoogle body pillow (one of my pregnancy must-haves) is a great sitting up aid for the girls! It creates a nice little nest where they can move around and explore without much restriction. 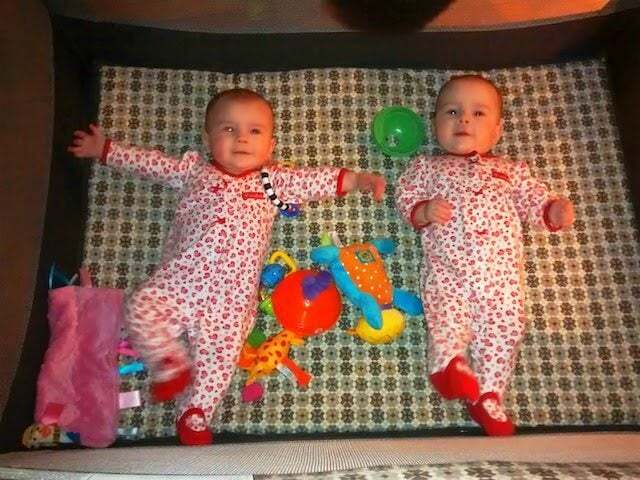 If they topple over they land on the pillow and just try to roll over (make sure you keep a close eye on them). We even bring it outside as extra padding. I’m also getting more than my money’s worth with the Snoogle. We have the Fisher-Price Space Saver high chairs that have a newborn recline feature. We needed these as our too-small kitchen did not allow for two moving adults plus two bouncy chairs or standard size high chairs. 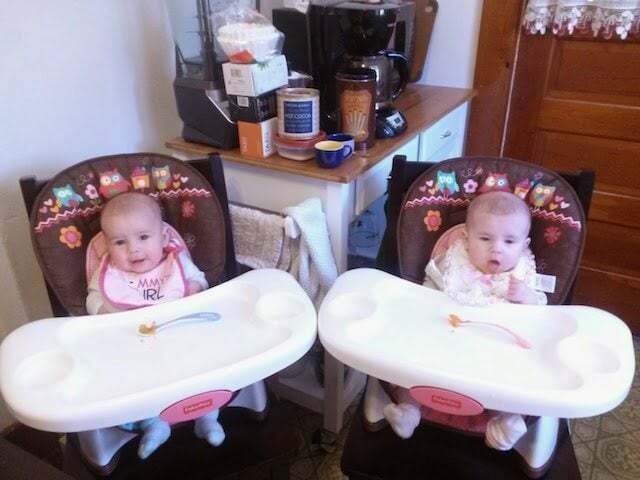 Starting from about 2 months old, on fussy days I would lay the girls in their high chairs and use links to string some toys on their laps, although they were more interested in watching me cook or clean up. They can still see you, are safe and entertained, and can transition from newborn high chair all the way up to booster seat for a big kid, making them a worthy investment. Due to the nature of how messy babies can be when they eat I would definitely buy these new. Great for the older babies who are bored with all floor all the time, they can exercise their muscles while changing up their perspective. 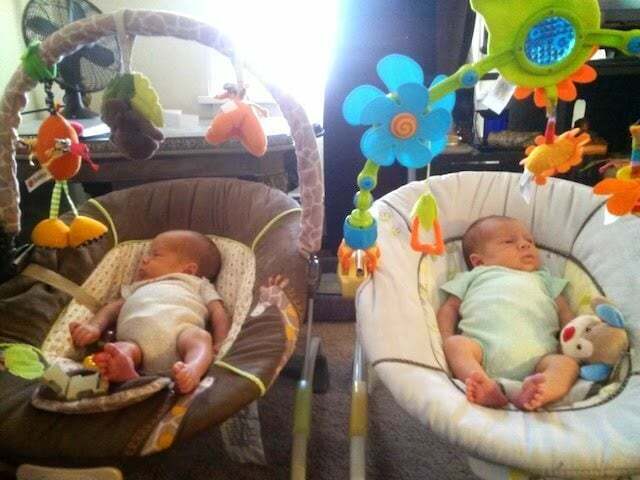 We picked up a used exersaucer and a new Fisher-Price Space Saver Jumperoo that they’re not quite heavy enough to really bounce in yet at 15 lbs; but they can practice standing, reach up for the toy bar, and push the buttons to make music. Experts say not to rely on them too much (research shows that overuse can actually hinder muscle tone development) but once a day for a half hour or so is perfect for a little exercise and a break for momma’s back! Definitely go for good used condition if you can as everyone and their brother has had one of these so they are easy to find in excellent used condition. Two Galt Playnests were gifted to us by my Dad for Christmas this past year and at first I was afraid they wouldn’t get used much. They were too small to sit in them and at first they just cried when we put them in. 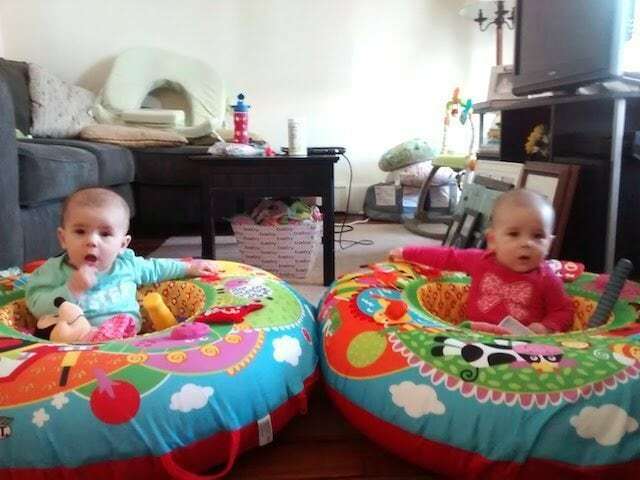 We waited a few more months until they were able to sit up better and now they love them. 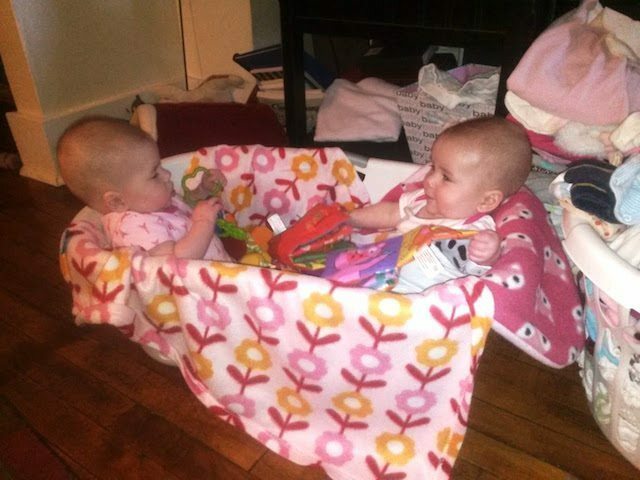 They are quickly outgrowing sharing the laundry basket and since twin families never have two empty laundry baskets, the playnests are perfect. They can reach their toys without feeling too restrained and the inflatable sides allowed them learn to sit in a safe space. Yes, they take up some space but not more than the people who are inflating pools in their living rooms to contain their kids (glad we’re not there yet.) It solves the issue of when I want them to play independently but they don’t need me to be right there to watch them in case they fall over. I can cook or clean up the house and they play happily in the position they want to be in. Originally we feared the twin size pack and play was a waste of money. They hated the bassinet part and didn’t sleep well in it. We packed it up within a few weeks and were planning on selling it until Viv started to move all over the place (no crawling yet but she can roll clear across the room in 30 seconds) and we needed a way to contain her while not inhibiting her movement too much. 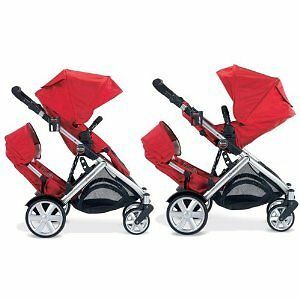 I know a lot of people rely on pack and plays but the twin size one is a necessity for two mobile babies. We tried fitting them both in a standard size one and they were just rolling over on top of each other. 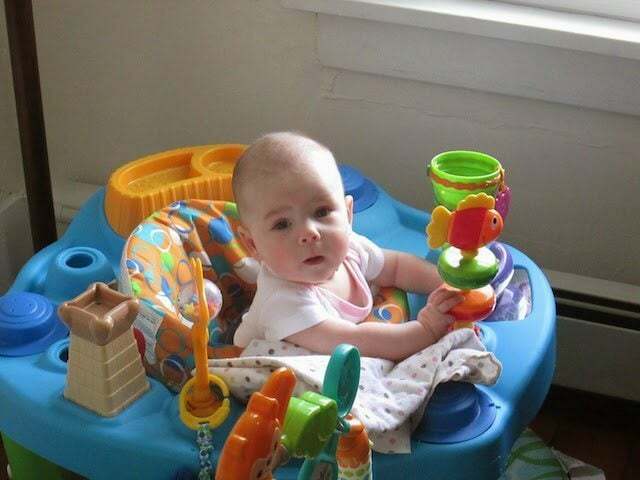 The added six inches or so on each side guarantees each baby has her own space, toys are contained and within reach and they’re able to move around and practice their skills safely. You can buy new or if you’re lucky you can find them used on CraigsList or Twin Resale Facebook groups. 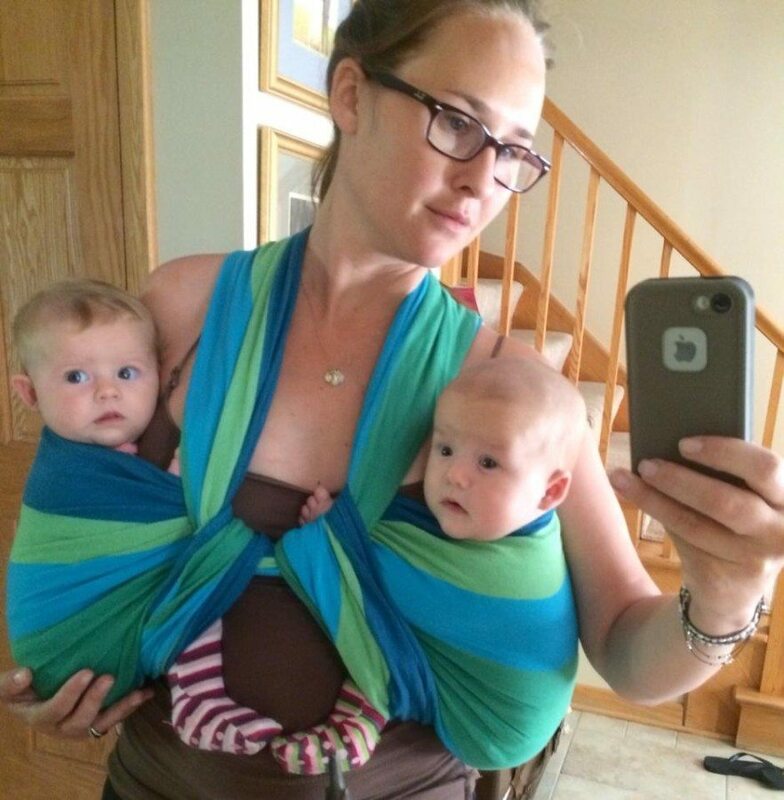 What about when you’re out and about with twins? 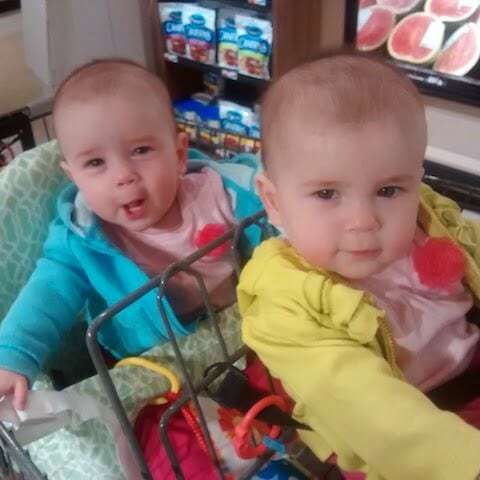 How do you grocery shop or run to Wal-mart with two infants?! The Buggy Bench is a brilliant invention by a twin mom that has saved my sanity. Trips to the grocery store, Target, or anywhere with a cart are a breeze. I fit 2 weeks worth of food and paper products in the cart with both the girls. The girls did great, they were so happy to be out and seeing new things and I didn’t have to wait until they were in bed to go grocery shopping. The seat was easy to attach to the cart, supported Viv really well, and looked adorable as you can see. So, new twin moms (or moms of 2+) take heart! There are many ways for every family to get things done with lively babies about, no matter what your budget or house size. Trust me, we’re living with the smallest of each! Just remember that while baby receptacles are great resources when you need a place to keep baby safe while you are otherwise occupied, babies should spend as much time as possible on the floor. Find a happy medium that includes lots of floor time and use these tips when you need a safe place to put your babies while you’re getting things done! 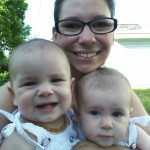 Maigen Beaulieu is a former child care provider turned Blog-At-Home Mom of 1 year old identical twin girls, Juliette and Vivienne. She lives in upstate NY with her husband, the twinsters and their two cats, Boots and WIllow. When she’s not wrangling the twins or blogging she can be found drinking wine and researching her family history. She can be reached via her blog Life and Love. Multiplied, on Facebook, Twitter and Instagram.